Creeping Phlox are lawn edging ideas that are ideal for rock gardens, topping retaining walls, edging pathways, banks, and slopes - a spectacular evergreen ground cover. 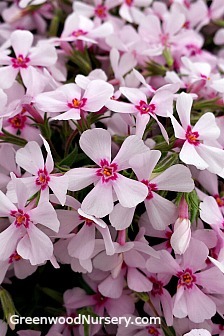 Phlox subulata grows vigorously forming dense spreading, mounds covered in bright candy-color blossoms. Masses of variegated flowers cover the top of this mat forming evergreen creeping phlox for a long period. Creeping Phlox are ground cover perennials that create a carpet of bright candy colored blossoms for bank plantings or rock gardens. Apple Blossom Phlox is a vigorous green and attractive as a flowering evergreen ground cover when not in bloom. Apple Blossom Creeping Phlox is ideal for pots and hanging planters, too. This two toned creeping phlox will spill over the edges of retaining walls for a graceful effect. Apple Blossom Creeping Phlox is great to mix with white and red varieties. Phlox is 4 to 6" high, 12 to 18" wide. Plant phlox in full sun, blooms in Spring. Our Apple Blossom Creeping Phlox are shipped in 3.5 inch containers, ready to plant, and start growing. Fertilize your phlox the first time in early spring, just after new stem tips show at the soil's surface. Phlox needs a constant supply of nutrients to make strong, steady growth. Sprinkle a 9-12-12 timed-release fertilizer into the soil around the plants and then mulch over the area. In late spring, after the plants have flowered, clip off spent blooms and then lightly fertilize again. Pull back the mulch, sprinkle the fertilizer onto the soil around the plants, and replace the mulch. Then water the plants thoroughly. This feeding will provide the plants with ample nutrients to support prolonged flowering. Prune the spent flowers off the plants to prevent them from burning the foliage.